Coral Expeditions knows the UNESCO World Heritage listed Great Barrier Reef better than most, having pioneered overnight cruises on the outer reef more than 30 years ago. Sailing from their homeport of Cairns, Queensland, their bespoke expedition vessel, Coral Expeditions II takes a maximum of just 42 guests in relaxed comfort on year-round three, four or seven night expeditions that encompass the best of the reef, rainforests and island. The tailor-made itineraries venturing to the pristine outer reef, and exclusive mooring destinations, allow them to offer a unique and unmatched experience of the Reef. Their expedition voyages are truly immersive, venturing far beyond the day-trips to the underwater wonderland that you’ve long imagined. Out there, your only companions might be a Loggerhead Turtle or Giant Skink. Resident Marine Biologists bring the species to life, with “touch and learn” displays onboard and in the water. Divers and snorkellers will delight in some of the world’s finest untouched coral gardens. All guests on board will be rendered speechless by the pure azures of the waters on this UNESCO World Heritage wonderland. Departing weekly every Monday this cruise includes all destinations in their three and four night itineraries. Snorkel, walk, swim and relax in some of the tropical north's most beautiful reef, rainforest and island locations. 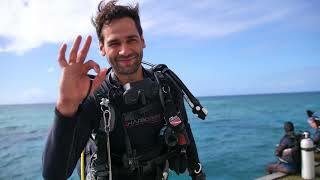 Fully guided by onboard marine biologist, dive instructor and expert crew. Day 1: Depart from Cairns on Coral Expeditions II, a small ship, at 5pm. Day 2: Travel to historic Cooktown and the Reef. Day 3: Visit Lizard Island and Ribbon Reefs. Day 4: Discover the Ribbon Reefs with a full day of exploration. Day 6: Cruise the Hinchinbrook Channel, and enjoy a beach barbecue. Day 7: Visit Dunk Island, and Nathan Reef. Day 8: Stop by Fitzroy Island to visit the Turtle Rehabilitation Centre, then return to Cairns at 1.30pm. Their four night cruise is perfect for those wanting to spend the maximum amount of time exploring the colourful coral gardens of the Great Barrier Reef. Enjoy a full day to discover two different sections of the rarely visited Ribbon Reefs, considered to be the most colourful and pristine reefs found anywhere along the entire length of the Great Barrier Reef, as well as the wonderful fringing reefs off Lizard Island and Two Isles. Day 1: Depart Cairns at 5pm and enjoy a glass of champagne on the top deck and watch the sun set. Day 2: Discover historical Cooktown before departing to Lizard Island for a glass bottom boat or guided snorkelling tour. Day 3: Relax, or take a scuba dive or snorkel at Lizard Island. Visit Ribbon Reef Number Nine in the afternoon. Day 4: Explore Ribbon Reef Number Three and Escape Reef. Day 5: Arrive at Cairns Wharf at 8am. Spend time exploring the underwater world’s of Coates and Nathan Reefs, and visit the Turtle Rehabilitation Centre on Fitzroy Island. Cruise through the Hinchinbrook Channel and enjoy sunset drinks on private Sudbury Cay. For an experience that offers a combination of rainforest, islands and reef, this itinerary is an excellent choice. Day 1: Depart Cairns at 11am. After lunch arrive at at Thetford Reef and Sudbury Cay. Day 2: Cruise to the Hinchinbrook Channel for a glass bottom boat tour through the mangroves before exploring the island's natural rainforest of snorkel on the fringing reef, just metres off the beach. Day 3: Enjoy a rainforest walk on Hinchinbrook Island (the Haven Track) before cruising to Nathan Reef. Day 4: Travel to Fitzroy Island for a visit to the Turtle Rehabilitation Centre and final snorkel off the white sandy beaches. Following lunch you arrive into Cairns at 1.30pm. Departing weekly every Friday this cruise includes all destinations in their three and four night itineraries. Snorkel, walk, swim and relax in some of the tropical north's most beautiful Great Barrier Reef, rainforest and island locations. Fully guided by onboard marine biologist, dive instructor and expert crew. Day 1: Depart Cairns at 11am for Thetford Reef. Day 2: Cruise the Hinchinbrook Channel and enjoy a beach barbecue. Day 3: Travel to Dunk Island and Nathan Reef. Day 4: Visit the Turtle Rehabilitation Centre at Fitzroy Island. Stop at Cairns for a visit to the Tjapukai Aboriginal Cultural Precinct. Day 5: Sail Historic Cooktown and the Reef. Day 6: Relax at Lizard Island and snorkel from the beach. Day 7: Snorkel their exclusive moorings at the pristine Ribbon Reefs. Day 8: Arrive back in Cairns at 8am.